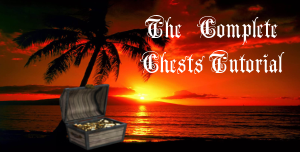 The Complete Chests Tutorial is up-to-date for RM2K3. Main Chest Tutorial for #RM2K3 complete. More added soon. Other chapters/versions soon after. http://t.co/qarJHKoclM pic.twitter.com/0C1ioOnGaJ — RPG Maker Times (@CompanionWulf) September 22, 2015 I’m planning on bringing the RMXP version up-to-date next, with RMVX/VXA next, and then creating a demo for each RPG Maker – possibly in the form of a game. The Complete Chests Tutorial is finally being given a long overdue update! Since my recent purchase of the officially translated version of RM2K3 from Steam, I decided to finally bring this tutorial up-to-date. I’m basically rewriting them but using the tutorials as templates and adding some additional features as well. Included will be some new chapters, which again were planned but never fully implemented. A downloadable demo will be available for each RPG Maker. Maps will be unique to each but the basic principles will be the same throughout. The demos will be more puzzle-orientated as well. Once complete, the Complete Chests Tutorial will also be uber-updated. Chests can contain higher-level items, such as weapons, which are only accessible when a character reaches a certain level. If the character is the required level, they can open the chest, otherwise it remains closed. Continuing the Chest Tutorials, we’re now going to create a trapped chest, i.e. when you open it, it will trigger a random trap, which will cause damage or affect the player’s status. Following on from Part 4a, which created a single combination, this tutorial will prevent you from opening the chest unless you know the complete combination beforehand. Combination locks can be placed on some chests, which will only be opened if the correct combination is entered, otherwise will remain closed. In this two part tutorial, I’ll demonstrate how this can be achieved. Wouldn’t it be better if the contents of chests were randomized, rather than fixed? This adds an element of surprise to the game, a sense of the unexpected.